The Los Angeles County Metropolitan Transportation Authority (LACMTA) said it had ordered equipment from UK manufacturer Thruvision. The company’s equipment is not currently used on UK public transport, but it has been trialled at the Farnborough Airshow. The scanners have a wide field of view and can screen passengers as they ride an escalator or enter through ticket barriers. The company says its scanners can detect suspicious items from up to 32ft (10m) away, and can scan more than 2,000 passengers an hour. However, it will be used on a pop-up basis rather than permanently installed at specific stations in LA. 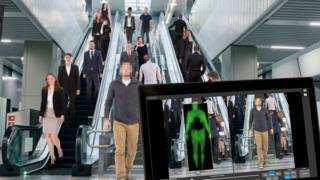 Thruvision’s system uses sensitive cameras that can pick up a person’s body heat through their clothing. The scanner does not emit any radiation. Since concealing an item under clothes blocks body heat from being emitted, the cameras can detect items that have been hidden. Human operators can inspect the captured images and decide whether further investigation is necessary. The company says no anatomical detail is revealed by the camera since it detects only body heat. David Pekoske, from the US Transportation Security Administration (TSA), told the Associated Press that the country faced “persistent threats to our transportation systems”. “Our job is to ensure security in the transportation systems so that a terrorist incident does not happen on our watch,” he said. Alex Wiggins, from the LACMTA, said the authority was looking for weapons that could cause a “mass-casualty event” such as explosives and assault rifles, rather than smaller weapons. The authority hopes to buy additional scanners that can follow individual suspects. The TSA has previously tested body scanners in New York’s Penn Station, which is described as the busiest rail hub in North America. In December, a 27-year-old man was injured when he set off a “low-tech explosive device” in a subway passage near Times Square, New York. Three other people suffered minor wounds when the device blew up in an underpass.